I’m pleased to say another natal hypnotherapy baby has arrived! 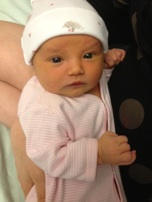 Baby Frieda made an appearance on 1st May at UCLH, weighing 3.5kg. This entry was posted in VBAC and tagged gas & air, Second Baby, UCLH, VBAC by Ruth. Bookmark the permalink. Ruth is a great teacher, calm, enthusiastic and communicates her passions and knowledge very well. I enjoyed the workshops very much and would recommend to anyone. Ruth was great, open and encouraging. She was also very knowledgeable and obviously well-researched and prepared. She was really helpful before the course too and answered my questions and sent me info by email. Thank you! Ruth is a warm and kind person who has made the workshops a delight to attend. I will recommend these workshops to friends and family.